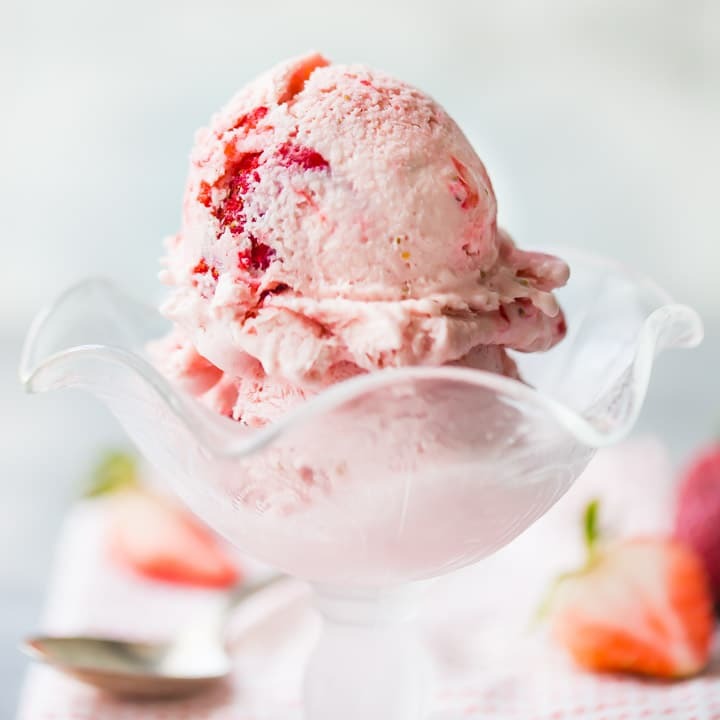 This strawberry ice cream is like a spoonful of summer! Bursting with fresh flavor, and so easy to make. No eggs, no cooking, and no ice cream maker needed! Today I’m sharing another of my husband’s favorites: Strawberry Ice Cream! We just love anything strawberry, especially at this time of year. The strawberries are at their peak. So sweet, juicy, and red! Buy up as many as you can, they’ll never be any better than they are right now! And there is so much you can do with them. My kids love when I make them fizzy Strawberry Sodas, Baked Strawberry Donuts, and Strawberry Pretzel Popsicles. But when I think of summer strawberry desserts, ice cream definitely tops the list. It’s the best! When I first set out to create this strawberry ice cream recipe, I wasn’t sure if I should base it on my Perfect Vanilla Ice Cream recipe, or my No-Churn Ice Cream recipe. I love a good old-fashioned, slow churned ice cream as much as anybody, but I ended up settling on a no-churn option, mostly because I thought you would appreciate how easy it is to make. With this method, there’s no cooking required, and it saves you several hours of chill time. 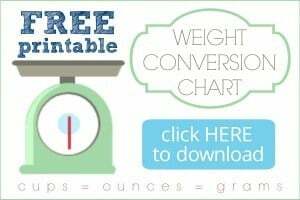 Plus you don’t have to clutter up your freezer with the canister from your ice cream maker! Well, I’m so glad I did because I really think it turns out to be the better-tasting option too. Because it’s so simple, the strawberries are really allowed to shine. There is nothing to get in the way of their sweet, summery flavor. This ice cream is bursting with fresh strawberry flavor. In my opinion, it’s so much better because it’s eggless. It’s light, creamy, and just so purely strawberry. That said, if you prefer an old-fashioned strawberry ice cream, you can totally add the strawberry puree and chopped berries to the custard base found in my Vanilla Ice Cream Recipe post. 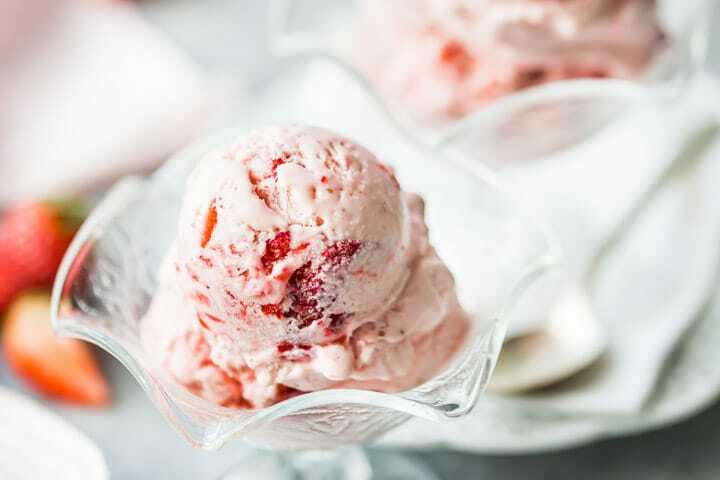 This strawberry ice cream is so easy to make, you won’t believe it! There are only 3 simple ingredients, plus a pinch of salt to balance the flavors. You will need heavy whipping cream (aka: double cream if you are outside the US), a can of sweetened condensed milk, and fresh strawberries. Puree 2/3 of the strawberries until smooth. This can be done in a blender or food processor, or if you don’t have either of those, you can just mash them with a fork. The rest of the berries can just be roughly chopped. This way, you’ll get plenty of sweet strawberry running all throughout, plus the occasional surprise of a bite of real fruit. If you prefer your strawberry ice cream to be smooth, just omit the additional 8 ounces of chopped strawberries. This strawberry ice cream is perfect on an ice cream cone or freshly baked waffle, or sandwiched between two soft & chewy sugar cookies. Or you can throw a few scoops into the blender with a splash of milk, for the strawberry milkshake of your dreams. But my favorite way to enjoy it is just as you see in these pics, simply scooped into a dish and eaten with a spoon. There is no adornment necessary. It’s creamy-sweet, summery, and such a treat! I hope you have a chance to try this strawberry ice cream recipe! It’s easy as can be and so summery. Nothing beats strawberries at this time of year. Especially in ice cream form- it’s just the best! In a large mixing bowl with an electric mixer fitted with the whisk attachment, whip the cream until it holds stiff peaks. Fold in the condensed milk, salt, pureed strawberries, and chopped strawberries. Transfer to a freezer-safe container, and freeze for 4 hours or until hard. 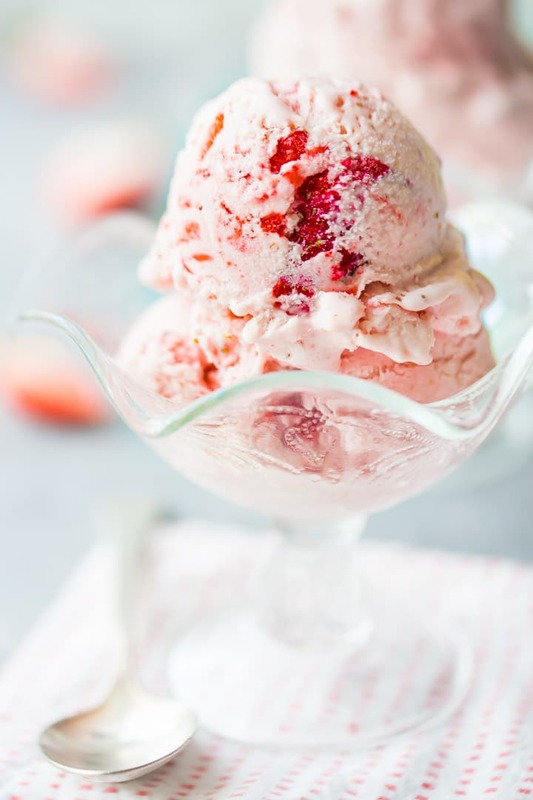 Oh, my gosh, I just had breakfast and now I want a big bowl of this gorgeous strawberry ice cream! It looks amazing!! Yummy! Strawberry ice cream is just what I want tonight! I’m ready for this spoonful of summer! I’ll take 2 scoops please! So easy and looks delicious! Using fresh berries from my garden makes this even more amazing! I just made this and now I have to wait 4 hours for it to freeze! It was so easy to make. The flavour of it is delicious and I can’t wait to try it frozen. Yum! Yay! Hope you love it as much as we did Lisa! Every blog needs a good no-churn strawberry ice cream! I have one which I make with roasted strawberries. So good! 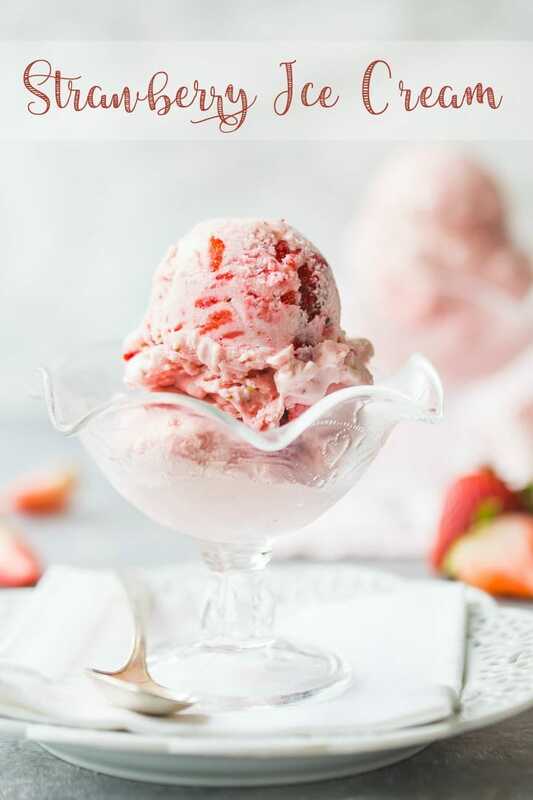 Roasted strawberry ice cream sounds amaaaaaazing! Thank you so much for stopping by Kate!